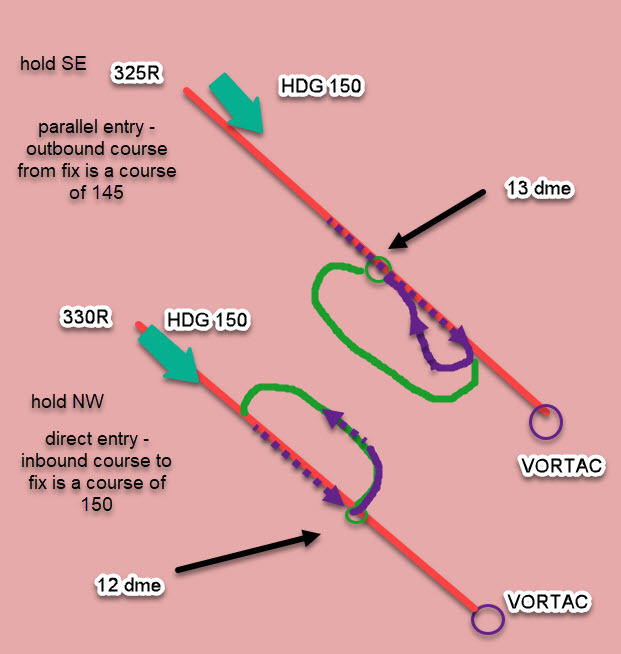 When/how to set the inbound or outbound course when intercepting a VOR for a DME hold? I have question for holding pattern. As I know, when I do DME holding I have to intercept VOR radial and decide entry. However, when I do this I am so confused and do not know how I can select inbound or outbound course. In this case, my instructor says "try to intercept outbound course 145 and make a holding." In this case, my instructor says "set inbound course 150 and make a holding." In both cases, the position of aircraft was NW from the ABC VOR, and my heading was 150 and distance was almost 18 DME from the ABC VOR. This is what I confuse that first instruction was setting outbound, but second instruction was setting inbound course for intercepting the radial. Could you let me know how I can figure out when I set inbound course or outbound course for intercept one for DME holding? *I use G1000 which has HSI. Not the answer you're looking for? Browse other questions tagged holding or ask your own question. When and how can pilots waive wake turbulence holds in the US? How do I clear an aircraft to exit a hold? How to correct for crosswind in VOR holding pattern without wind information? What is the time information on the G1000 MFD map during a hold? Where can I find details of the holding models for JFK, Schiphol, Heathrow and Dubai? What should you do when the pattern is crowded? How do I fly a direct entry holding pattern when approaching from an awkward angle?